Are you waiting for promo fares from Philippine Airlines? Here are PAL promo seats you can avail for 2017 to 2018 trips! 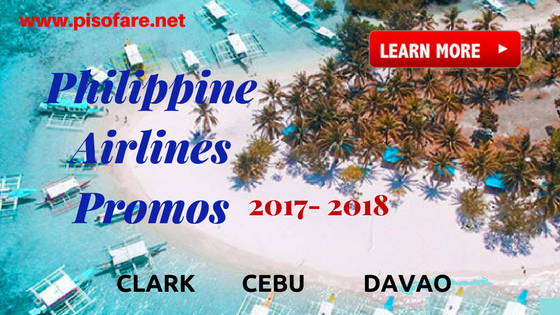 Fly with Philippine Airlines sale tickets for its’ new routes from Clark, Cebu or Davao. With PAL ALL-IN one-way Economy Fares discover new Philippine amazing destinations. No worries if you will be bringing baggage as PAL promos include 7 kilos cabin baggage and 10 kilos checked baggage allowance. Enjoy also free in-flight snacks during your trip. PAL domestic sale tickets are inclusive of fare, government taxes & fees, ticketing service fee and surcharges. Book the Philippine Airlines one-way promos which can be combined to avail round trip fares. Fares of infants without seat is 10% of adult ticket rate. PAL Promo tickets are not available during black-out periods. Avail the affordable PAL promo tickets by booking online at their website: www.philippineairlines.com, or buy fares at Philippine Airlines sales and ticket offices in LUZON, METRO MANILA. You may purchase the cheap tickets at accredited travel agencies and booking offices too. Promo fares are limited and subject to seat availability. Want to receive airline promo updates? Like our Facebook: PISO FARE TICKET to get seat sale and promo fares notifications in your newsfeed! Follow us in Facebook so you will not miss any promo or seat sale!